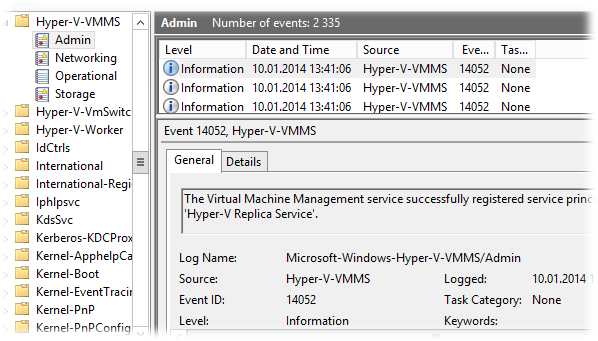 Failed to register the service principal name 'Hyper-V Replica Service'. Failed to register the service principal name 'Microsoft Virtual System Migration Service'. Failed to register the service principal name 'Microsoft Virtual Console Service'. This problem may also occur if the NTDS port has been restricted to a specific port on your domain controllers. If this selected NTDS port is not within the default ranges, you must add this port by running the script in the "Resolution" section on every Hyper-V host. 'Get the Service Restriction object for the local firewall policy. NewOutboundRule.Name = "Hyper-V - Allow outbound traffic from service to Static RPC port (TCP 39100)"
В результате успешного выполнения скрипта на хосте Hyper-V в ключ реестра HKEY_LOCAL_MACHINE\SYSTEM\CurrentControlSet\services\SharedAccess\Parameters\FirewallPolicy\RestrictedServices\Configurable\System будет добавлено соответствующее разрешающее правило. DisplayName = "Hyper-V - Allow outbound traffic from service to Static RPC port (TCP 39100)"
Таким образом, начиная манипуляции с кастомизацией дефолтных параметров AD DS будьте готовы к подобным граблям в самых неожиданных местах. Подскажите, пожалуйста, статья применима для Windows server 2008 r2? - ошибки и поведение совпадают. Не могу сказать, так как у меня уже давно нет в обороте хостов виртуализации на Windows Server 2008 R2. Попробуйте.